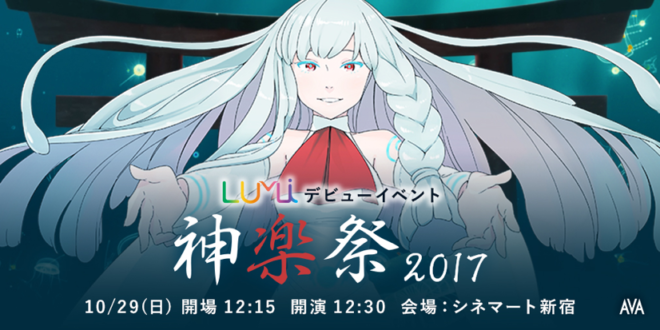 Last year, LUMi made her concert debut at ‘Kagurasai 2017’ which we reported on in our previous article. Since the concert concluded, the LUMi Official YouTube channel have gradually been uploading videos of each song that appeared in the CG concert section of the event. Now that all of the videos are available on the channel, I (Jade) would like to share my thoughts on each of the songs that were featured and the videos which have been created to accompany them. The CG concert opened with the atmospheric instrumental piece, Shinkai, which begins in total darkness with dramatic piano chords and a bell-like synth sound, echoing like sonar and sounding almost ethereal. We then see through the perspective of someone opening their eyes into an underwater world, with a single form floating ahead at first, but then more and more forms appear until we are surrounded by jellyfish. Among these floating forms, a large and ancient-looking fish swims by, pausing a moment as if to look at the viewer, but then continuing on their way. As we gaze upon the creatures around us, blurring in and out of view, we become aware that there are familiar white shapes, like tentacles of some kind, floating into view at the corners of our vision, as if from ourselves. It is then that the identity of the viewer becomes clearer. A large jellyfish drifts into view, close to the viewer, and a pale and white-sleeved hand extends as if to reach for it. There is now no doubt at this point as to whom we are viewing this ocean scene through. As soft strings begin to play along with the gently building piano, the viewer’s eyes close once more and then re-open to find an ornate building-like shrine or a palace ahead of them, just beyond the plant life. As we draw closer to this place, our eyes close once more, and then we finally get a glimpse at LUMi from another set of eyes. We see her eyes closed at first, then open and fade out to white. And then she looks up at the viewer, as if surprised to see us, and then the video fades to white one final time. As the video came to a close, I felt almost melancholic at having to leave that underwater realm behind. I was impressed that, even without the imagery that had been shown, the music itself had somehow given the sensation of drifting blissfully below the waves in such a calm and peaceful place. The next track, good night, begins with LUMi seeming to float in another weightless world where petals drift lazily by. The music in this piece also incorporates piano and strings, but sounds much more whimsical this time with a lightness to it, which compliments the way that LUMi moves. A soft beat can also be heard in accompaniment. As LUMi begins to sing with a gentle but clear voice as the beat steadily builds. Then we hear the bass come in, getting the sense of something coming as the colors of the world change and the petals floating around LUMi move with more fervor. And then, the piano chords become more powerful and the chorus kicks in with guitar and drums that made my eyes widen with wonder. We get a closer look at LUMi at this point with the camera focusing on her as she sings with more power and emotion than before. As the chorus comes to an end, the visuals return to a calmer scene, but the beat is much more prevalent than before, adding to that upbeat feeling. This time, the petals are gone and instead stars and clouds drift by LUMi as she sings, creating the impression that she is flying through the night. As the verse builds and the second chorus starts, I became aware of the addition of a more electric synth sound, which adds to the complexity in the chorus. When the chorus finishes and LUMi’s note fades, there is a wonderful piano solo accompanied by the synth again as we watch the moon’s various phases in the sky, and the stars appear to dance along with the music. As we come to the last chorus, I can almost hear the longing in LUMi’s voice and see it in her expressions as the camera comes closer to her face. As she dances elegantly, petals and stars fall around her in the final line, and we then see LUMi lying down contentedly as if curled up ready for a deep sleep. Lumière opens with an almost other-worldly chorus of voices and a light building in the distance. A soft melody plays and then a kick beat signals the beginning of the verse as LUMi starts to sing. 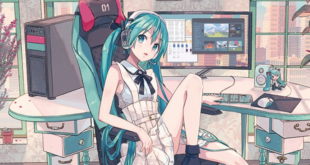 The vocals are more staccato this time and, as the beat kicks in and builds, there is definitely a more electronic influence apparent in this track. The imagery throughout the video is again of the ocean, with jellyfish drifting by and LUMi interacting with the creatures she encounters. LUMi’s voice appears to have an echo to it that adds to the impression of something not quite of this world. The song finishes with LUMi leaping out of the water in front of the full moon and reaching out toward the viewer. The video is quite short so I almost felt a little disappointed that it did not go on longer. In the next song, Luminitium, electronic sounds slowly build as we are shown a city seemingly trapped in time underwater. When LUMi begins to sing, she drops into the water from above and her words come in short, echoing bursts as if lost in the emptiness. Then suddenly, the music builds with melancholic strings and LUMi sings with a power and emotion that becomes especially apparent in the higher notes. The contrast between the quieter verse and the striking chorus is quite beautiful. The faceless figures shown in the underwater city also seem to add to the melancholy of the piece, as if there are untold stories behind each of the characters we see. Again, I almost wished that the video were longer so that I could hear more! In contrast with the previous song, the next one starts off with an almost sassy synth sound, guitar, and a rhythmic kick and hit beat. We see LUMi walking slowly against a wavy red background for the opening sequence, and then she is transported to a well-lit stage as she begins to sing. Mesmerizing lights dance across the stage as LUMi dances and her vocals seem to almost have an air of attitude to them as she sings. As the chorus approaches, the guitar and drums build as LUMi shakes her head and throws her arms up in apparent frustration. The background becomes red once more, perhaps to accentuate her emotions at this point. In the second chorus, we see LUMi more closely through various camera angles that spin around her head, again seeming to highlight an emotional conflict. There is definitely more of a rock influence in this song, which is shown off well with a guitar solo after the second chorus, during which we even see LUMi appearing to do some headbanging in time with the music. In the coda, LUMi’s vocals become fast and almost frantic and the visualizations on screen become almost chaotic. The video then becomes dark and the instruments quiet down for a moment as LUMi sings and everything around her is black and white. Then the drums and guitar return in force, and the colors reappear for the final chorus before fading away once more. After the last song, the next piece brings things down a little again by beginning with a beautiful piano chord and visuals of a single droplet of water falling. As the first drop falls, we hear LUMi speaks a sentence that appears on screen. Then more drops begin to fall, each bringing a new message. Both LUMi’s voice and the sound of the droplets echo softly and streams of colored light emerge where the droplets fall. After a while, these streams seem to converge like shooting stars and, as the piano music fades away, we see that a towering pillar of color and light has formed. Then, as familiar jellyfish creatures drift up from below, the piano returns and are soon accompanied by soulful strings and a gentle guitar. LUMi begins to sing softly, and as the music builds, electronic synth sounds add layers of complexity. As the song progresses, it sounds like more voices join her in an almost angelic chorus. We see images of the jellyfish appearing to dance with each other and shots of a solitary piano under a spotlight, adding to the emotion in this piece. The effect is quite spectacular. 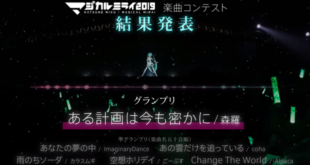 To conclude the concert, Yoake no Uta begins to play and the credits are displayed over various pieces of fanart from the VOCALOID community, which were uploaded on Twitter using the hashtag #るみーつ. In Yoake no Uta, LUMi’s vocals start off softly with gentle piano and string accompaniment. 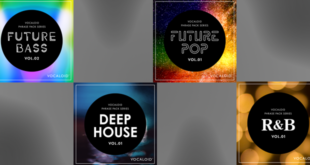 As the beat builds and bass comes in with the drums, electronic sounds can be heard as highlights over the melody, and LUMi’s voice sounds particularly powerful in the high notes of the chorus. After watching all the videos from Kagurasai 2017, it was interesting to hear the different genres of music that LUMi’s voice was able to adapt to for each song. I was quite impressed by the ability of the producers to harness both her soft, gentle sound whilst also giving her clarity and power when necessary. In terms of the visuals presented in the concert, I felt a certain sophistication in the use of imagery to suit the subject matter in each song, and also to capture the themes of LUMi’s character. The themes of water and light seemed most prevalent, and they appropriately reflected the themes which AVA had stated to be associated with LUMi. Each video almost seemed to tell a different story about how LUMi interacts with and understands the world, and I felt like I too came to understand her better by watching and hearing her sing. Next VOICEROID2 Kizuna Akari Nominated for a Vector ProRegi Award!